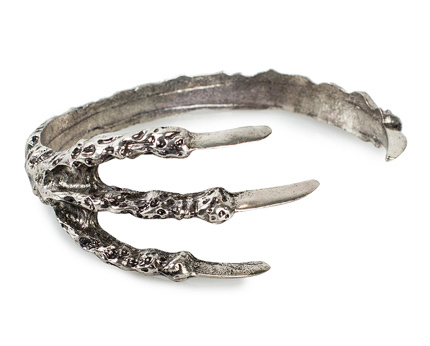 Antique patterned bracelets in the shape of a claw from NLY Accessories. 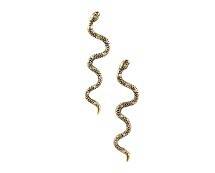 Earrings in the shape of snakes. Gold coloured with mounted stones. Length 7.5 cm. Gold coloured earrings from JFR. 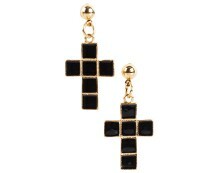 Jewellery in the form of a cross with black plates. Length 37 mm. 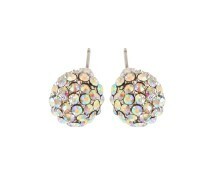 Silver look diamante stud round earrings. Length approx. 0.5 inch. 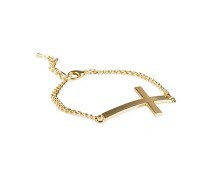 Silver and gold coloured chain bracelet with a cross in the front. Closes with adjustable snap hook. Length 23 cm.